To inspire and enable students to reach the highest musical standards, and to instill in them a lifelong love of music. Since its founding in 1977, The Music Studio has been the music school of choice for thousands of students from throughout the Capital Region–from Hudson to Saratoga, from Canajoharie to Petersburg, and all points in between. Many stay with us from preschool through high school, and some now send their children to us. Because we provide a comprehensive musical education that exists nowhere else. Our classrooms, our instruments, our curriculum, and our faculty are all finely-tuned to fulfill their singular task: giving children the skills and desire to achieve musical excellence, and through that to strengthen their minds and enrich their lives. When founder and director Noel Liberty established The Music Studio, she was determined to teach music differently. 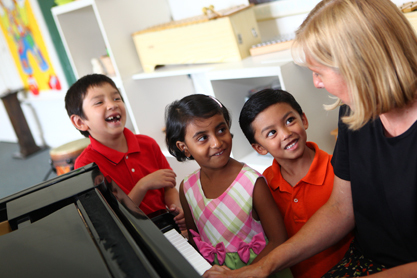 She believed that children have not only an innate love of music, but also an incredible capacity to learn. So she developed a curriculum that tapped into both, using fun, high-energy musical activities to teach skills and concepts fundamental to making and understanding music. She wrote textbooks appropriate for students beginning as young as age 4, added grand and digital pianos and myriad other instruments, and hired more teachers, expanding the school to the celebrated Capital Region institution it is today. The heart of the Music Studio is The Foundation, a school-year program of group lessons for children as young as age 4, after which our students continue in The Piano Program through high school. But we also provide the highest quality music classes for very young children, group classes for adult students, and a variety of popular summer camps. Underlying all of these programs are a deep love of both music and learning and the belief that everyone has the capacity to attain musical excellence.